But wait – why is that bad? After all, unlike with tennis, you CAN go back and improve your previous work. And you can FIX it. That’s the great thing about writing, especially nowadays, when much of it is done in electronic form. You can ALWAYS go back and edit. In fact, you should go back and edit, but only up to a point. Let me explain: The longer I’ve been writing, the more I have learned that a two-step process is the way that works best for me – first writing, then editing – and that keeping the two separate makes the finished product better. I’m quite a perfectionist, and my inclination is to do it right the first time. But when you apply this to writing, it only leads to being stuck. You will start a sentence full of inspiration, but invariably you will falter half-way through. How often have I sat there, with the rest of the story in my mind straining to get out, battling to be set down on paper, and me bottling it all up because I couldn’t let the first sentence go and just get on with it. This proved a particular problem when I translated my book. Translating is a whole different animal, and at first I really struggled with each sentence. None of them sounded good to me, and I was constantly revising and revising and not making progress. By the end of the book, I’d finally found a better rhythm: translate each sentence, no matter how clunky, and move on. Then I’d go back after each chapter and edit, usually resulting in a complete rewrite that flowed much better and was more loosely based on the original. Gaining the distance between the first draft and the second rewrite resulted in much faster progress. Then I went through a third time ironing out minor flaws, and THEN I passed it on to my editor. I think this method works for original writing just as well as translating. You should write freely for your first draft. Just write, and don’t be very critical. Don’t try to fix your sentences, don’t have doubts. Just write your story. Once it’s finished, let it sit for a bit, and only THEN go back and edit. And have someone else edit it (see here). Maybe even engage a couple of proofreaders. The more eyes that see your book, the better. And yet. There is a danger with editing. There is the danger that you never finish, just like with your parenting. You get to a point where you simple have to let go. Because there is always something else. You will drive yourself insane trying to find it all and fix it. 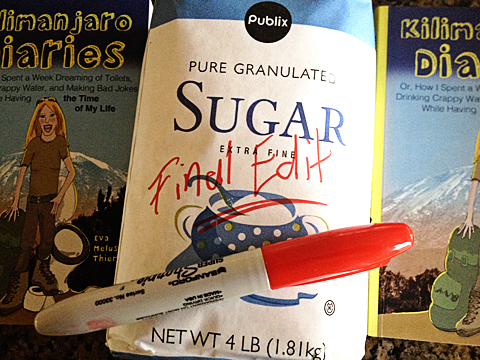 Charles, an author friend of mine, described it with this great analogy: Editing and proofreading is like a bag of sugar. You empty it all out, but when you turn it over, there is still sugar left in it. So you turn it over again and shake it, and there is more sugar coming out, but there is still some sugar left in it. No matter how many times you repeat the process, you still find more sugar crystals in your bag, and eventually you’ll just have to declare it empty and get on with your life. Your book is just like that bag of sugar. You can proof-read and go back and fix it a bazillion times, until you almost want to puke, and still there will be a few grains of sugar, i.e. typos or commas left. There is no sense in killing yourself trying to reach a state of perfection. Just like they say, perfect is the enemy of good. If you’re striving for a perfect book, you’ll never have one. Better publish a good one that includes a few elusive sugar crystals, take a deep breath, and then go write your next one. I also need two steps. I ignore the mistakes so I don’t spend my entire life on the first chapter, and then fix. I can’t tell you how sick and tired I am of my own book! I just received my first proof for the German edition and know I should check it one last time, as you never catch all the errors from reading a file, but I SO do not want to read my own book AGAIN! Give me something NEW! I know how sick and tired you get of your own book! And after all the editing, your own and the professional’s, you’ll still find things in the final published product that you think you could have done better. Over-editing is also a big problem. You can mess with your work too much and not make it better.